As May comes to an end, it's pretty clear that achieving this year's challenge will in fact be "challenging." 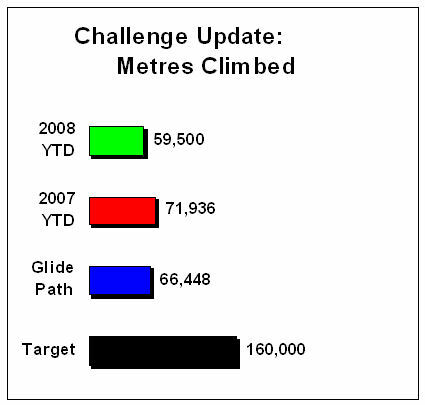 As May comes to an end, it’s pretty clear that achieving this year’s challenge will be “challenging.” I am well behind last year and +6,000 metres behind the necessary pace for my 2008 goal of 160,000 metres or 525,000 feet of vertical ascent. Between continuing (minor) asthma problems, a calf injury, and now unbelievably sore ribs from my recent fall, I have been forced to take a few “breaks” from the bike. But enough whining! With the July Tour d’Enfer and a few other plans, there will be plenty of opportunity to make up the lost ground. As to my secondary weight loss goal …. I am only about half way there … too much beer while sulking! Year-to-date the cycling highlights have definitely been several big rides up above the snow line. Here are a few favorite photos so far this year. Great set of photos Will. Although you are short of where you would like to be 60k vertical is still a very impressive number. I hope you can make up the rest of the ground. Weight loss and beer aren’t particularly compatible. Still, it would be like asking me to stop breathing.